"What is the difference between regular cheesecake and NY cheesecake?" I asked him. "Umm...I think it's higher and doesn't have a crust on the side," he responded. Now, my son, being a thespian, has a yen for ANYTHING New York. I am sure he has a secret desire to run away and live in NY. Now, I had to research some recipes on cheesecake. First of all, it is not a cake, it is a custard. There is no flour in this recipe...only two pounds of cream cheese! Yikes! I found a couple of recipes and decided to combine the two. One was from the Food Network and the other from Marlene Koch's Splenda recipes. I like the idea of sugar free....only if it tastes good. Cooking with Splenda granular is fine...baking is a different thing altogether. The few cookies I have tried taste good, except they lose a little bit of the color (they don't brown as well) and instead of staying 'crispy,' they go soft the next day. Marlene's recipe for cheesecake is good and I made a couple of changes. First, I did not use fat-free cream cheese. I used 2 pkgs. regular and 2 pkgs. of reduced fat. Doing this brought back some of the creaminess and texture to the cake. I mean, custard. Whatever. The second thing I did was add lemon and orange rind to the custard. 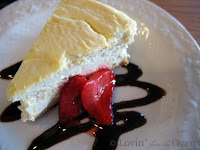 This added a light citrus flavor that made the cheesecake taste great all by itself. Oh, and one more change...I did not do the sour cream topping that is baked on during the last 15 minutes. That's the great thing about recipes...you can add or change some things to your liking! Next time, I would probably double the graham cracker crust; it wasn't thick enough for me. This was the first time I ever gave my food a "bath." Huh? The last time I ever gave a bath was well over 15 years ago! But hey, I decided to try it, because the first time I ever made cheesecake, it was runny inside...not good. Especially when you make it for company. So I guess giving your cheesecake a "bath" is important! Yes, this recipe is sugar free, but not fat free. But it turned out great and no one knew it was sugar free! If you don't have Splenda, you can substitute it with granulated sugar, using the same measurements. Preheat oven to 325 degrees. Wrap a 9" springform pan in heavy duty foil to waterproof. Begin making the crust. In a mixing bowl, combine graham cracker crumbs, butter and Splenda. Press into the springform pan. Bake crust for 5 minutes. Cool. For filling, cream the cream cheeses until very creamy. Beat in Splenda, lemon juice, vanilla and zests. Add eggs one at a time, beating briefly after each addition. Stir in sour cream. Pour cream cheese mixture into crust and smooth the top. Place cheesecake into a 9x13" baking pan. Place in oven. Pour hot water into the 9x13 pan until it reaches halfway up the sides of the cheesecake pan. (This is the "bath") Bake for 45-50 minutes or until the sides of cake appear firm but the center still jiggles slightly. Leave the cheesecake in the oven for an additional 15 minutes. Remove from water bath and cool completely. Chill cake in the fridge over night....this is important to create a nice, dense cake. Serve with fresh strawberries, jam, chocolate, whatever you want! Yummy! Interesting to have remembered about the bath. Does that just provide a bit of a steam bath, and since steam is hotter than water, cook it so there's no runny? Happy Birthday, Zach! It's a good thing your mom is willing to go through a lot of research and work to make your NY choice! I did some research on water bath or 'bain marie' for custards. It's to keep the custard from 'curdling' because of the eggs. Also, when putting the water into the bath, it should be hot, near boiling, to keep the custard from cracking on top...I didn't know that! Thanks go to Joe's Pastry blog!